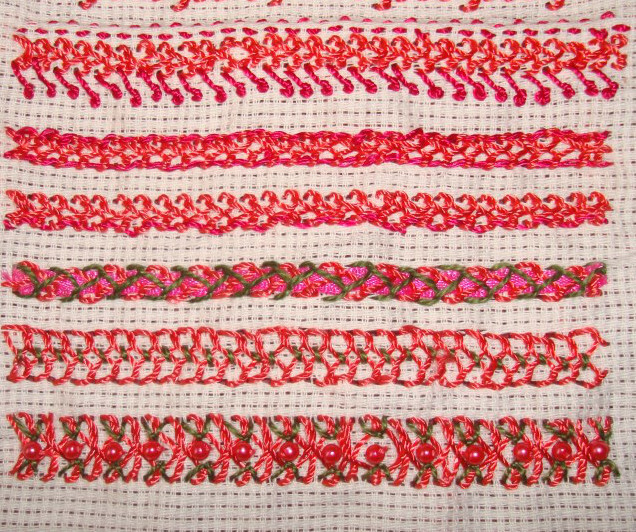 1.The details on this part of the sampler- the basic plaited feather stitch is worked on the first row, the stitch was worked in two colours in the second row, the feather stitches on one side are shorter than the other side, making an open and closed plaited feather stitch variation in the third row. 2.Plaited feather stitch is laced with blue thread in three ways in these samples. 3.The other stitches combined with plaited feather stitch in these rows are – cross stitch, fly stitch, chain stitch and pistil stitch. 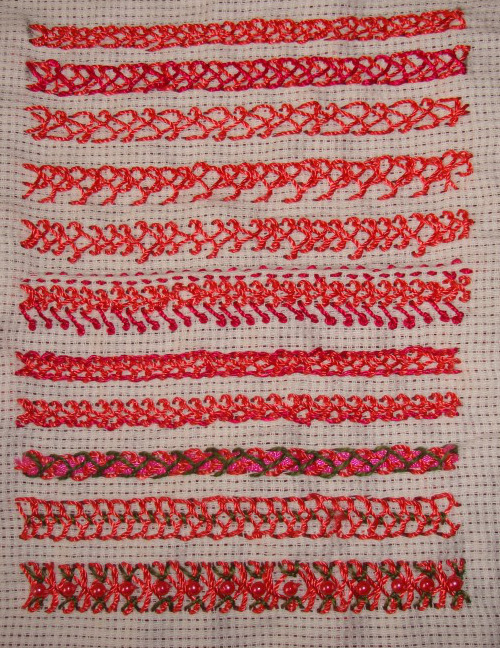 I liked this stitch because of the braided effect and the width of the stitch. It will be lovely to work borders with this stitch. I used the same variegated cone thread to work some more samples of this stitch. 4.Two rows of straight feather stitch are worked together in these samples. 5.After working a wider version of this in the first row, herringbone stitch is worked over it. 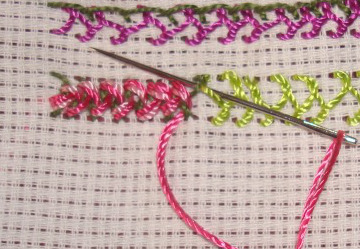 Buttonhole stitch was worked over the straight feather stitch line in the second row. The inner skeleton [?] is whipped in the third row. This last row looked like a braid, to remember the working, I took pictures. again going back with the needle under the next one .. The same treatment was continued to get this braid. 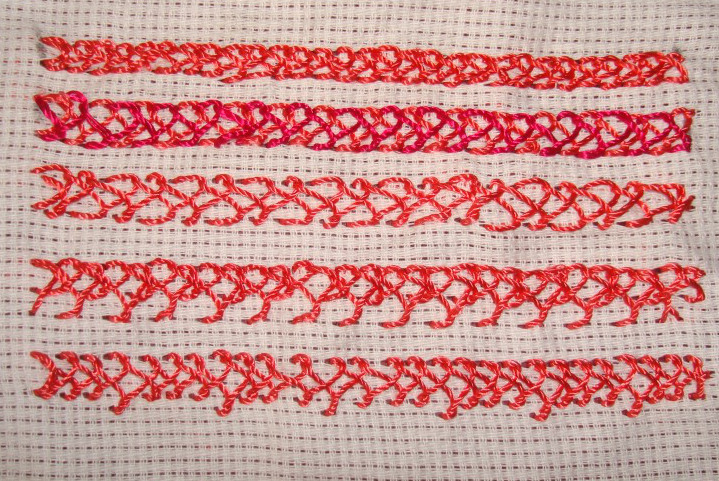 6.Detached chain stitches and french knots are worked over straight feather stitch rows in these samples. 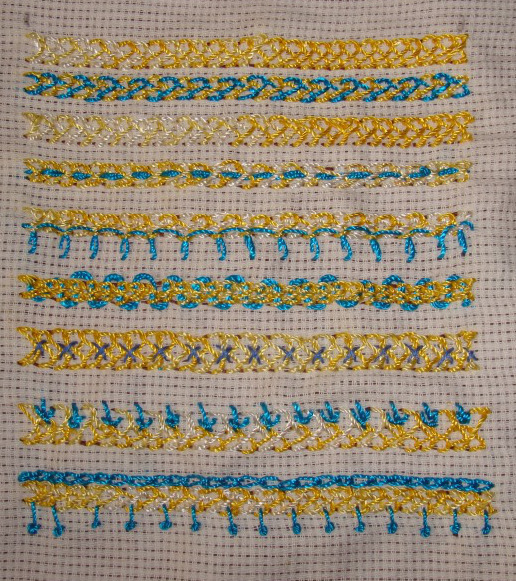 7.A narrow version of the stitch worked over the wider version. 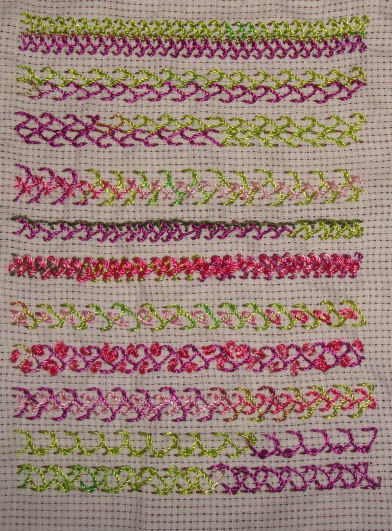 The place for this sample would have been appropriate on crossed feather stitch sampler I suppose. One side of the straight feather stitch was twisted in the second row. Getting too adventurous I tried twisting both the feather stitches in the last row. Not a good idea. Still when I wonder how this row was worked in future, reading this might help.